Russian President Vladimir Putin and Indian Prime Minister Narendra Modi, right, during their meeting at Taj Exotica Goa, India. 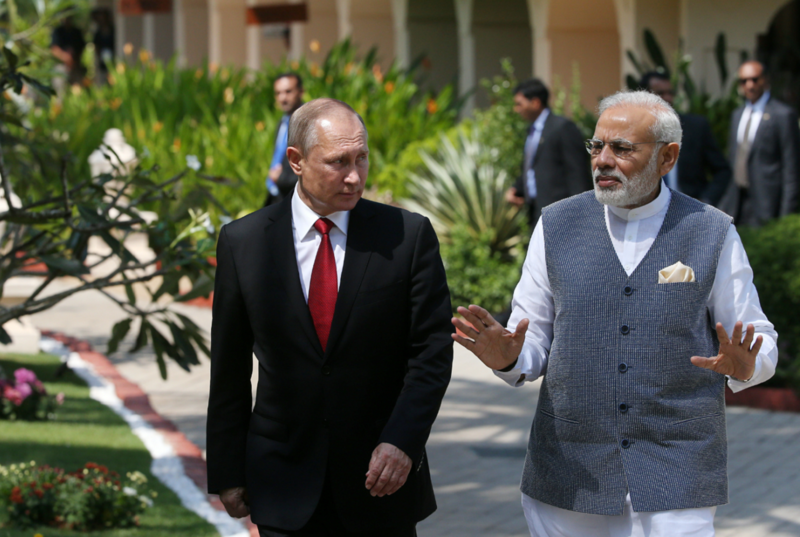 The Russia and India Report has compiled a list of the 5 most popular and interesting articles about Indo-Russian bilateral economic relations and cooperation. In 2016, India was the partner country of INNOPROM, an international exhibition of industry and innovations, held in Russian city of Yekaterinburg. Discussions on a potential free trade agreement between India and the Eurasian Economic Union seem to have been relegated to the back burner, largely because of the former’s insistence on services and investment being part of an agreement. Several options exist for Moscow and New Delhi to solve the impasse. The presence of Russian President Vladimir Putin and India’s Prime Minister Narendra Modi at the World Diamond Conference in New Delhi in 2014 added not only the much-needed diamond sparkle to India-Russia economic ties, but also helped to revive the drop in diamond trade. Sammy Kotwani, the president of the Indian Business Alliance, Moscow told RIR about bright Indo-Russian investment prospects in the energy, pharmaceuticals and tourism industries. Board Chairman of the Eurasian Economic Commission Viktor Khristenko talked to RIR about the prospects for India's partnership with the Customs Union of Russia, Belarus and Kazakhstan.